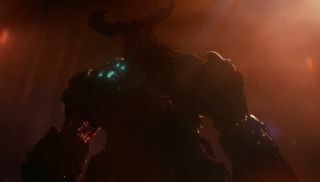 We already knew a new Doom game was incoming, thanks to Bethesda's promised beta access for pre-orderers of Wolfenstein: The New Order. Now we get a tiny CGI glimpse to further moisten our appetites, and the promise of more info to come. The full reveal will take place in the only location an Id game's unveiling can: QuakeCon. The event, this year running from July 17 to July 20, promises a much more enlightening look at this latest trip to Hell. For now then, sit back and bask in the unholy glow of the newly designed Cyberdemon.